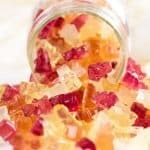 This healthy gummy candy is easy to make and much better for you than the store bought gummies. Full of good nutrition, plus they're gluten and sugar free! Whisk all ingredients in a small sauce pan. Heat over low heat until mixture loses its "applesauce" consistency and starts to liquify. Allow gummies to set. You can either do this by placing molds on a flat surface in the freezer, fridge or on the counter. The freezer is your quickest option and will take about 10-15 minutes to set. Remove from molds and store in the fridge in an air tight container. These will last about two weeks, although the texture becomes firmer over time, they are still delicious!